One event that gathers people with common interest in computers, electronics and information technology, the world’s leading event for IT and digitalization where companies and organizations demonstrate their technologies and products; event where lectures and talks are held and new IT trends defined – you are already guessing, I’m talking about CeBIT 2015. 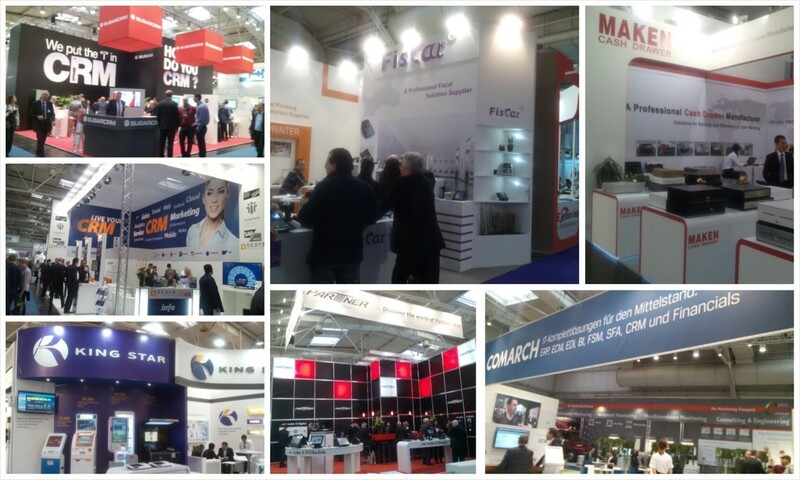 CeBIT expo is held in Hannover fairground annually in organization of Deutsche Messe AG and this year it took place from 16th March – 20th March, 2015 with the lead theme – “d!conomy”. D!conomy represents digital transformation and start of a new era of digitalization which is already well underway especially in manufacturing and automotive industry, retail and logistics, but soon to be more and more presented in SMEs worldwide who are already profiting from digitalization. 3,300 companies from 70 countries attended CeBIT, among them there were global companies such as Huawei, ZTE and Xiaomi from China (the CeBIT 2015 Partner Country), as well as major corporations such as Deutsche Telekom, Hewlett Packard, Intel, Samsung and Vodafone. 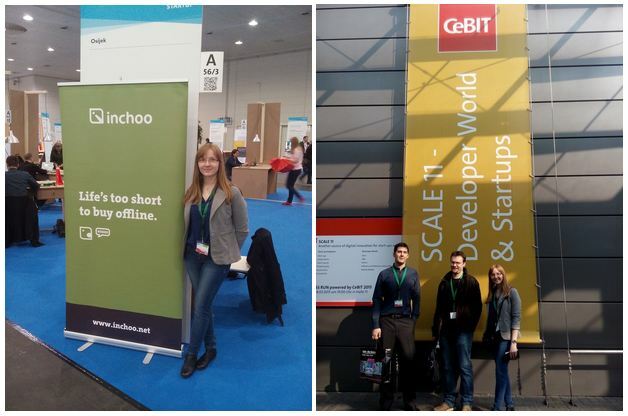 Inchoo also attended this year’s CeBIT among other IT companies and startups from Osijek Software City as part of the project Development Of Regional ICT Business Incubator Support Network – DORIBIS Network (project from EU program IPA IIIc). We were all placed together at Hall SCALE 11 (out of total 17 halls) which was reserved for startups and Developers world which is the new meeting point and marketplace for software developers. Each company had its own booth space, Inchoo was at booth A56/3 which we shared with Osijek Software City. Right after our arrival, a lovely hostess welcomed us with a warm smile and a welcome bag with a note “Welcome to Hannover, City of International Fairs!”. 🙂 The package also included important notes and advice with emergency numbers, Hannover guide, exhibitor badges and admission bracelet for SCALE 11 Pub Crawl. Only a few minutes after, first visitors started to arrive at our booths in search for more information about our business, services and products. We also managed to take some time to look around and explore startups in our hall and visit exhibitors in other halls during our stay at CeBIT. Here are only some of the startups from SCALE 11 that I found interesting: Flexperto – a platform for online communication with clients, Recosphere – a learning system that recognizes individual user buying preferences and acts like a perfectly trained salesperson which optimizes recommendations for e-commerce products, Vroggles – customized cardboard VR viewer for smartphones, MARA pen – pen powered by a new generation of motion sensing technology and many more. 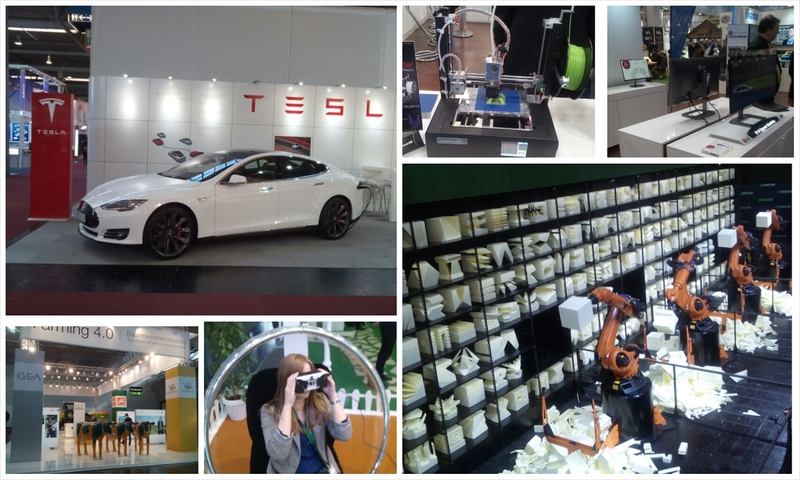 During the next few days we also visited the other halls and checked out attractions at Hall 12 (DatacenterDynamics and IT enables) and Hall 13 (Communication and Networks) where we found some impressive exhibits such as various 3D technologies and printers, Tesla’s new Dual Motor Model S, Farming Lore 4.0 with their cutting-edge tractor and ZTE virtual headset. There was also some interesting displays at Planet Reseller (Hall 14/15), Global sourcing (Halls 15, 16, 17) and Internet of things area, such as Google’s Google Watch, LG’s curved ultrawide screen and exhibition of four enormous industrial robots – Robochops – that were shaping a polystyrene cube and producing small furniture items created by visitors in a 3D app enabled on their main website. Fun fact – Total of 2,000 cubes were processed during the CeBIT and will be shipped to their creators all over the world. Here were also presented innovations and CODE_n initiative (an international initiative for digital pioneers, innovators and groundbreaking startups) which organized contest among 50 of the most promising digital startups during the CeBIT. In other halls covering the area of Digital Business Solutions (Hall 2, 4) and ECM Input/Output Solutions (Hall 3), we found some big names such as Microsoft, IBM, Samsung, BlackBerry, Fujitsu, Huawei, Dropbox, T-mobile, SAP, Alibaba Group, Realtech, Eset and many more exhibiting their latest innovations. I would like to point out the Halls 5 and 6 which were reserved for ERP, CRM, BI, HR and Commerce area. Some of them were: SugarCRM who were presenting how to create extraordinary customer relationships using their CRM solution, GEDYS IntraWare showing their products CRM2Host – a CRM solution that you use directly via your web browser, and IntraWare 8 – a tool that enables a complete control over management process and the 360 degree view of the customer along with Comarch who offered various solutions from CRM & marketing, cloud products, ERP, BI Commerce, HR, ECM, financials and web shops. There were also many companies providing POS solutions such as Partner Tech that exhibited their high performance touch POS terminals and all-in-one terminals, Kingstar Information Technology offering kiosks with designs from the inside-out without limitations to one size, Chinese Xiamen Fiscat Electrical and Xiamen MAKEN Tech who offered various types of POS products and cash drawers made out of heavy gauge steel. Each hall had more than 150 exhibitors so these are only a few that left the impression on me, if I counted all of them this article would have infinite scroll ;). During our stay in Hannover, most of the time we spent at CeBIT so we didn’t have much time to look around the city and go sightseeing, but we were more than familiar with their Metro traveling every day to CeBIT and back to hotel. However, we managed to go for a short tour to the Hannover center one day before our trip back to Croatia. 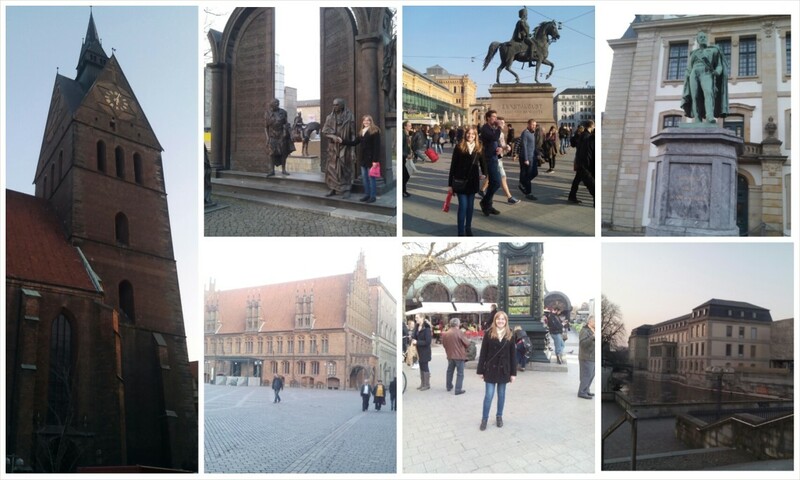 We visited Old Town district including Holzmarkt square and The bronze statues of the Göttingen Seven. Even though it was a short trip, we were surprised to hear more than a few locals speaking Croatian language. We also visited few local pubs and finished the night at SCALE 11 gathering at one of the pubs catching the last train back to Sarstedt (where our hotel was). This was my first time attending CeBIT and to me it was a great experience to see up close all these new technologies, innovative products and digital solutions at one place. All in all, CeBIT was a great place for networking and it allowed us to see from the first row what digital transformation represents and to follow up new IT trends that are already underway and some that are yet to be. Regarding talks and lecturers, there were many interesting ones even though most of them were tailored to German native speakers, so I didn’t have chance to visit a lot of them. If you have visited this year’s CeBIT feel free to share your experiences and comments. The next CeBIT event is in Australia 5th – 7th May 2015, will you be there? Vesna handles most of initial client communication, so chances are she was (or will be) your first contact with Inchoo.